To Gotham’s credit, ”Welcome Back, Jim Gordon” actually gives the audience a solid payoff, something that was sorely lacking in the conclusion of the Electrocutioner storyline, which boasted a climax as jarring as a glass of cold water to the face–or your mechanized, chest-strapped device. At the very least, this week’s episode takes its case of the week and builds to a climax that’s serviceable to the storyline and to the characters within it. That’s as nice as I can get though as, once again, Gotham shows a complete lack of vision while failing to make its procedural elements compelling. This week’s case involves the murder of Pinky Littlefield, a member of the Uptown Assassins, who are either a generically named rings of killers or a funky fresh band fronted by Bruno Mars and Mark Ronson. Pinky was left hanging with drugs placed in the heel of his shoe, a “Public Service Homicide” as Bullock calls it, since the murder hasn’t harmed anyone who’s innocent. Everything seems to be looking up for Gordon and Bullock as a witness, named Leon Winkler, steps forward and offers to come down to the station so that a sketch artist can create an image of the killer. Like any well-meaning, minor character on a television show though, Winkler is murdered while waiting in the interrogation room. The way the murder is shot, and much of the subsequent investigation, is representative of Gotham’s worst procedural qualities. 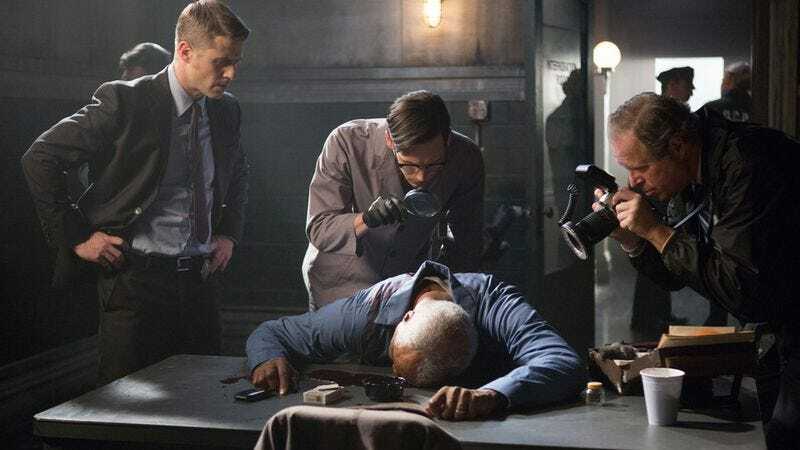 The murder and the discovery of the body is boilerplate procedural editing; we get the quick stabbing of Winkler, then a smash cut, complete with the sound of the crime scene camera flash, to Gordon and Edward Nygma examining the body. The problem isn’t even necessarily the rote setup, but the larger familiarity of the storyline. The procedural elements of the show leave no room for dramatic tension. Every single case of the week this season has adhered to the same template, with only the slightest of variations from time to time, and such redundancy and predictability make it difficult to create narrative momentum and keep us, the audience, captivated. Sure, we know nothing horrible is going to happen to Gordon because we know the general path his career will take, but that doesn’t mean dramatic tension and stakes have to be lost. The only thing the audience has to latch on to is Gordon’s morality, but it’s not enough to drive the story. Every case sees Gordon bumping heads with the higher ups, and coming up against a system that’s broken, that doesn’t privilege good police work. Heck, I’m pretty sure the entire role of Sarah Essen in this season can be boiled down to, “repeatedly tells Jim he can’t fight the system.” Here she is again in this episode, telling Jim, who’s convinced that Arnold Flass of the GCPD killed Winkler, that he has no hope of taking down a cop or challenging authority. That kind of exposition is acceptable in a pilot episode, where character motivation and world building needs to happen, but coming more than halfway through a season is ridiculous, especially since we’ve seen some version of that in almost every episode. It’s hardly even worth discussing how the investigation turns out, because it’s all so familiar: there’s the horrible interrogation montage, the speech from Bullock telling Gordon that he’s in over his head, followed by Gordon doing whatever he wants anyways, and eventually solving the crime. 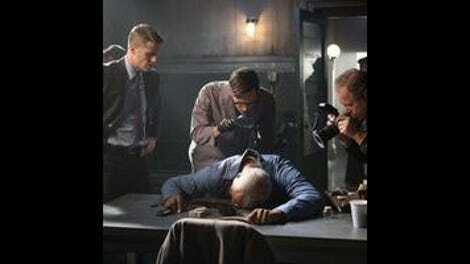 By the episode’s end, Gordon has used Oswald Cobblepot, who has insider knowledge of the drug trade, to get a murder weapon and a tape of a GCPD cop named Delaware, who admits that Flass, who’s been operating the stash houses he’s in charge of shutting down, is the one behind the killings. The involvement of Cobblepot, who sends one of his goons to force the information out of Delaware by torturing his wife, is meant to complicate Gordon’s moral universe, to suggest that he’s compromised his squeaky-clean reputation. The final scene, which sees Delaware begging Gordon to keep his family out of it, should be a revelation in terms of story and character development, forcing Gordon to reckon with the favor he called in. With any luck, the consequences will play out over the next few weeks, but in the moment, the scene is so overly dramatic, and so out of touch with everything that came before it, that any emotional impact is stymied. Even this season’s more reliable storylines, like the developing rapport between Alfred and Bruce Wayne, and the mob power struggle, flounder this week. Much of the mob storyline is reduced to cartoonish nonsense, with Cobblepot spending the majority of the episode showing off his new digs (Mooney’s old joint) to his mother. The whole arc is almost saved by Mooney’s sudden interruption, coming after Butch has saved her from a menacing man named Bob. Cobblepot, drunk on champagne, is up on stage delivering his welcome speech to an empty room, revelling in the perfect execution of his plan. In walks Mooney though, with Smith going full badass, pointing a bat at him and telling him that he needs to project if he’s ever going to hook in his audience. It’s a wonderful moment that establishes the character traits that enabled Mooney to obtain a position of power in the first place. If only the rest of the episode had this kind of commitment to tone, character, and storytelling. There are plenty of moving pieces–Bullock has some sort of relationship with Mooney; Gordon is trying to clean up the city; Nygma is acting like Lloyd Christmas; Cobblepot is trying to run the city–but none of them colaesce into a larger story. Everything on Gotham, and in “Welcome Back, Jim Gordon,” feels haphazard and disjointed, with no clear destination or narrative motivation. Never Mind The Bullocks: Gordon’s partner was surprisingly serious this week. With that said, “I respond to crises as they arise” is as on-the-nose a character descriptor as any, so that’s the pick this week. I don’t even know where to start with the budding romance between Edward Nygma and Kristin Kringle. On the one hand, it’s nice to see the show taking its time with something. On the other hand, I’m not sure where those two characters fit into the larger story, even as a tangential presence. The developing relationship between Bullock and Mooney is promising, not only because it presents a complex dynamic, but also because it’s a relationship that’s been slowly developed over time. Like I’ve said before, Gotham is at its best when it slows down the narrative pace and allows the storylines room to breathe, therefore letting the audience connect on a deeper level. The Bruce-Alfred-Selina stuff this week is cute, if inconsequential. Both Camren Bicondova and David Mazouz put in solid performances though, deepening the understanding of their characters, be it the idea that Selina resists love due to a fear of abandonment, or the idea that Bruce’s upbringing leaves him out of touch with other people. Is Butch magic? I have no other way of explaining his escape from that van.